What is Newswire? Is it what I'm looking for? 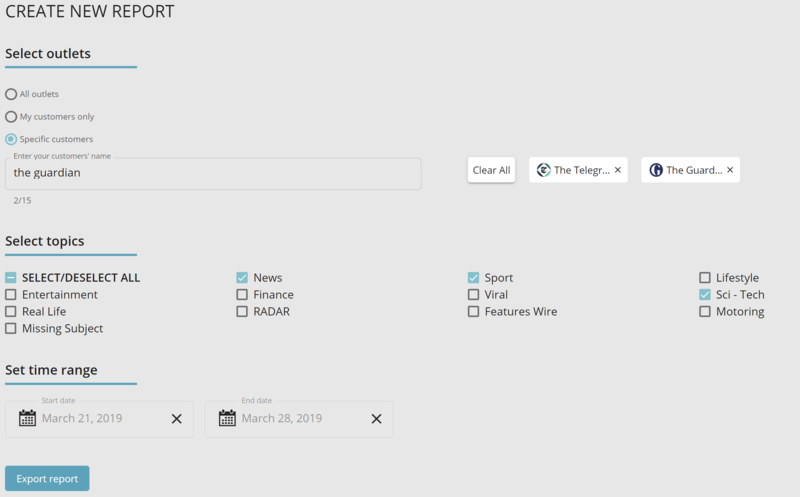 The Newswire module has been specifically developed to help News Agencies all over the world monitor the usage and social performance of their stories. The user interface is designed to be visual and simple to use. A quick glance is enough to to show which outlets have used your stories, how much of each story was used by the outlet and how these stories have performed online. The Newswire module is a real-time interface, through which users can customise and filter according to their needs. There is also a dynamic reporting function to generate performance reports for different customers, stories, topics and timeframes. Newswire is under constant development. New functionalities, additions and fine-tuning is being pushed constantly. If you have questions about a specific feature, don't hesitate to contact our team via the chat box in the bottom right hand corner.